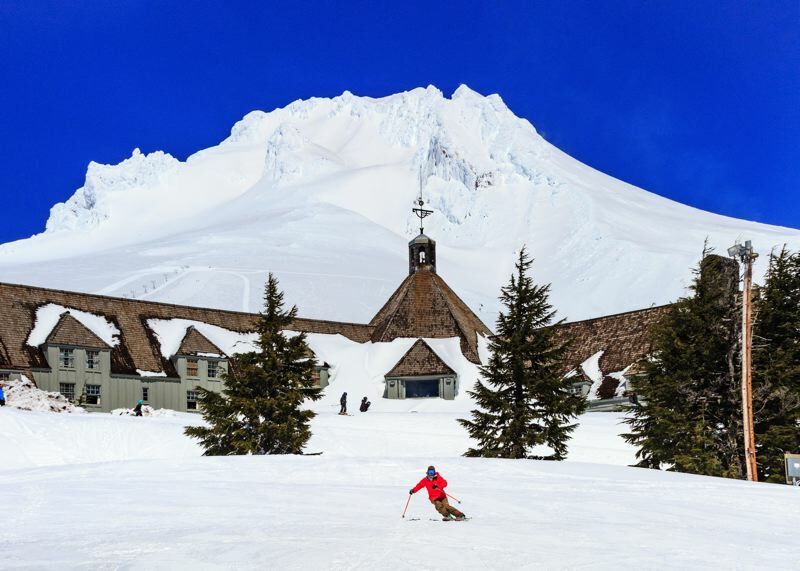 Spring has sprung, and Mount Hood's ski resorts are riding the wave of belated winter snowfall that, with a little additional dumping here and there, will carry them well into the traditionally warmer season. 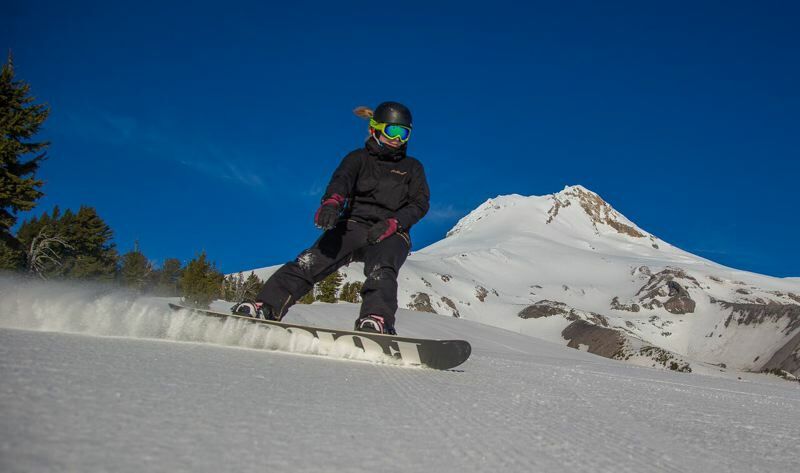 Despite January and a chunk of February being drier than normal, the numbers already reveal an impressive comeback season for skiing, snowboarding and visitors to Mount Hood. Mt. Hood Meadows on the mountain's southeastern face had to wait to open some elements until mid-February, but the winter resort has seen an upswing in snowfall in recent weeks. "Early on we weren't able to open our lowest lift, the Mt. Hood Express," said Dave Tragethon, vice president of marketing for Meadows. "That also limited access into Heather Canyon, which is expert terrain. We came through January and February, even with the snow conditions being less, we had ... one of the craziest seasons. We had some pretty violent weather, icy winds ... and still over the weekends our parking lots filled up by 9:30 a.m."
In the last week of February, Mt. Hood Meadows received 108 inches of snowfall and is now 25 percent ahead in visitors compared to an average March. "My concern was whether we'd be able to make it through the season with good conditions," Tragethon said. "I have great faith in our ability to create good conditions with what we have." To date, Meadows has amassed 99 inches at its base and 145 inches mid-mountain. "With the 99-inch base, snow conditions are not an issue," Tragethon added. "We will finish with great snowpack and great ski conditions. We're sprinting to the finish line; we're not limping to the finish line." Tragethon is looking forward to those "great ski conditions" making the Meadows' upcoming events to remember. The Full Sail Bank Slalom event went on sale in February and sold out within four days. Tickets are still available for Meadows' Suits and Boots event on April 14, though you should buy soon because about 120 of the 200 tickets to be sold are already gone. "It's telling me people are looking forward to coming up and being here in the spring," Tragethon said. "I have great confidence we're going to finish this season strong. It's way too early to give up on this season, that's for sure." To the west of Meadows above Government Camp, Timberline Lodge and Ski Area staff are practically swimming in snow. "It's going to be a good spring," said John Burton, Timberline's director of Marketing and Public Relations. "I think we got 120 inches (of snowfall) in 10 days. In that compressed time frame, that's not normal, but we loved it and so did our customers. ... Anytime we can accumulate a base like this, it's great for us. Just a little insurance." Burton added that there are several factors that contribute to a ski area, so "regardless of what's going on with the weather, there's a critical mass in Portland … a critical mass of people coming up to ski and snowboard. Weather is not impacting that as much as you might think." At the moment, Burton is looking forward to people coming up for the resort's annual spring break event, "Joy Break," which he describes as "a big party on the mountain." "Today we're sitting at about 11 percent above our historical average (in terms of snow)," Burton said. "So, we're looking forward to a good spring." Timberline, because of its altitude, is typically able to operate year-round, but every little bit of additional snow definitely helps. "We're fortunate enough at Timberline to have Palmer Snow Field, so we run 12 months a year," Burton noted. "(This snow accumulation) is going to extend the skiing and snowboarding opportunities for our customers. It's going to be more days for people to come up to the mountain and have a bunch of fun." Though Mt. Hood SkiBowl, adjacent to the Government Camp village, is the lowest elevation ski area on the mountain, Marketing Director Sam White is echoing the delight of other resorts. "Weather-wise, this spring is looking good. We've gotten about four inches (of snowfall) in the last 24 hours," he told The Post on Thursday, March 15. "Right now, we have about 53 inches at the upper bowl. That's enough to operate through mid-April." White admits the winter months were not particularly kind to SkiBowl, and year-round at the resort's lower elevation "we get a lot of rain, which ends up eroding our base." "On a good year, we're at about 300 inches, and our year-to-date is 203 inches," he noted. "It's always a gamble with the weather and because we're at a lower elevation, we're more susceptible. … We're definitely down from last year, but not significantly." As March progresses, he anticipates an uptick in visitors. "January and February weren't looking great. We had bare spots and it was really looking grim," White said. "It took us a long time to open our upper bowl. We had to open that in January, which is late for us." With now an at least near-average amount of snow, White is gearing up for spring events without much concern. "For spring break we have a full roster of events," he said. "Overall it's still been a good year." On March 24, the ski area will host its 16th-annual Snow Beach Festival, complete with a rail jam, pond skimming, eating contests and plenty of opportunities for Cosmic Tubing, the resort's light-and-sound-enhanced innertubing slope. 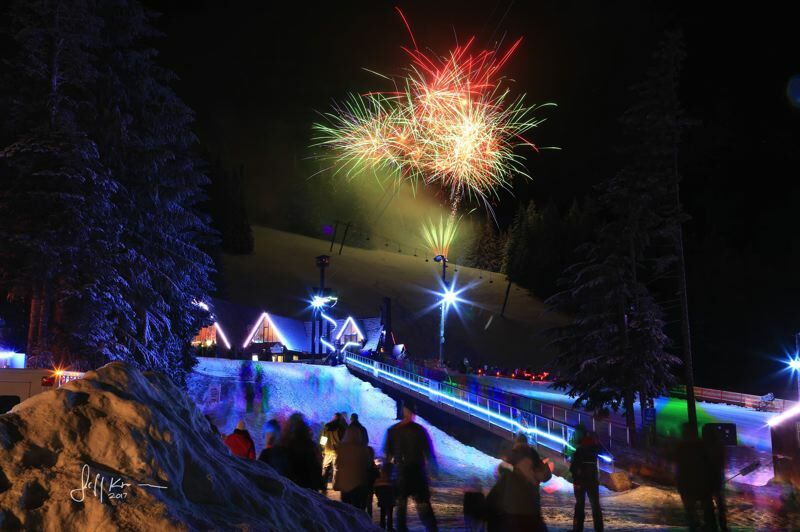 Less than a week later, SkiBowl will host its 30th-annual Ski for Sunshine, where anyone can ride for free with the donation of 10 food items. SkiBowl typically closes around mid-April to transition into to its summer adventure park season, which begins around Memorial Day in May. "Lower snow does, however, mean a longer summer season," White said. "We're trying to get more people up here to enjoy the mountain."